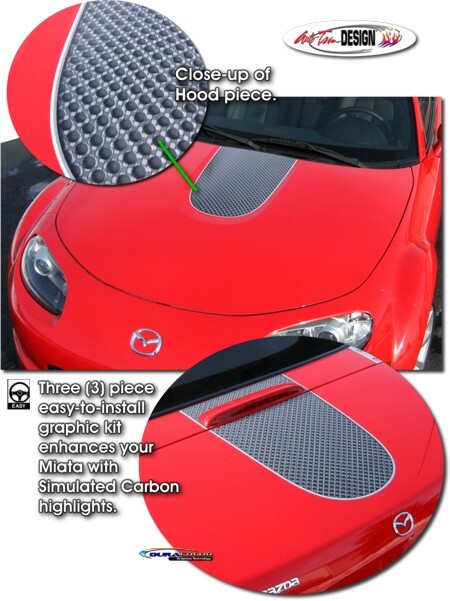 Check out this awesome three (3) piece easy-to-install Hood & Rear Lid Graphics kit. Uniquely designed to fit within the Hood indentation found on the '06-'15 Mazda MX-5 Miata, graphic features a perforated simulated carbon print and is trimmed with a simulated brushed surround as shown. This graphic product is manufactured from a premium adhesive-backed automotive grade vinyl material with an image that is printed to the surface with our DuraCOLOR Graphics Technology. This stripe package is not just a set of 14.75" (37.47cm) strips in a box. Our graphic kit consists of prefitted and contoured pieces as shown in the illustration. Kit is specifically made for the '06-'15 Mazda MX-5 Miata and will not fit any other vehicle.